Timing – I’m off the elixir bandwagon because we don’t have a quiet space at the office, which means either getting up at crap-o-clock or trying to do astral tourism… on the toilet in the men’s room. I could have just drank the stuff but it seems like a short change. Also I didn’t want to be swigging from a flask in the middle of the office, so this project really needs to be put on hold for a bit. The Sphinx – it occurred to me on the train that the riddle of the sphinx is not to literally “be man”, or that the powers of the sphinx are literally to know, to will, to dare, to keep silent. It just doesn’t make much sense on the face of it. I was reading Crowley’s Occult Symbolism in Childrens Stories, and it occurred to me that for one, the powers are linked as day is to night (the second riddle no-one remembers) but that both the answers are the same. First man crawls on all fours, then man walks, then man walks with a crutch, and then he is dead. In this way we also have the magicians coming of age. First he is born, and this universe becomes superficially known to him. Then he learns as a child and tests his boundaries and susses out his Will or the occult mysteries – as he dares to know them. After that he is master, of his Will. And, upon crossing the abyss or dying, he is silent. Lebanon Cedar is explicitly mentioned as sweetwood, but also as bow wood. The bow was a coveted item and the tree and the bow were both given to man and coveted by the Gods who couldn’t take it by force. My grossly layman reading of it (assisted by Google) is that the bow might have been a staff, pillar, or spear. The writing is clear that this item “projects” but the writing is not explicit in how far or by what means. Either way there is a neat tie in here to Dee. Raphesh is the God of Pestilence, who was called on by Baal to both inflict and cure disease. Raphesh-Baal would have been his name commanded by Baal, and Raphesh-El would have been the spirits name when commanded by El. This is fairly clearly a nod to Raphael, but I would be at a total loss to track the evolution of the name across languages. In that same vein, Kothar Wa-Hasis works and sounds a lot like (Kothar) Aiwass. But, this idea would require the new Aeon to be essentially Islamic in nature, which isn’t something I’m completely comfortable with and certainly don’t have the language chops to figure out. Islam in the present day would essentially have all us magi killed, but there’s no country in the world today practicing Islam by-the-book. I sort of hope one of the existing Islamic states decides to be tolerant of the Occult but what I’ve seen in the periphery of Facebook, HainnaTV, and so forth hasn’t been encouraging. I should start calling these the PhAQ. Picture 33H in Liber E as part of Book 4, or Page 15 Plate 4. Sit on the floor, put your knees as flat on the floor and fully bent as possible. Looking down at your groin, they should make a diamond with your feet together. Grab your ankles and pull them toward your trunk. Then, straighten the back as much as possible to get a good airway. Your arms should be as straight as possible. This position seems to be the best match of “braced” and “asana” I could come up with. It works because I have two different ranges of motion in my knees at this point, so one’s “braced” is the others “overextended”. This also lets me gently pull the knee in by the ankle, so eventually I plan on having matching knees if I can do it without killing myself. Notice that Crowley curls his head down, this is bad for breathing. I try to keep my back straight and my head extended to keep the airway open. Since sitting like this tends to compress the abdominal area, this isn’t the best position for breath, but I believe it meets the requirements with minimal modification. Excerpted from H: Why didn’t you comment on the psychic value of the elixir? I personally thought I gave a fairly decent account of it, but perhaps you mean “the elixir itself”. Like with any new tool or ritual, I feel like people who jump into it all HUR DUR THIS IS MAH WIZARD-OPINION miss the forest through the trees. Fact is, all ritual is framed up in outer ritual. Even if I were to perform the ritual “on the etheric plane” or somesuch it is easiest for our minds to hold the idea of a physical temple space. A plane is only defined by a series of reference lines, which in turn are defined from points, and all of these are physical analogies. The first part of getting to know an elixir or the effects it possesses is to use our grossest senses to perceive it, and only then move inward. I did entertain the idea that a more concentrated elixir might also have better magical effects at the expense of physical beauty, but a more concentrated version would also require less in the dose. It probably evens out. The search for a four-leaf clover would begin by examining a multitude of clovers, and hopefully each one would be interesting and unique unto itself, without possessing the psychic qualities of a particular clover the person seeks. I have a week of these I plan on doing, so I plan on enjoying the clover so to speak. The elixirs are a gold mine. Perhaps not because of some occult virtue how I made mine – mine is far too diluted – but because upon taking them, they have the same effect a good smoke does on the senses. 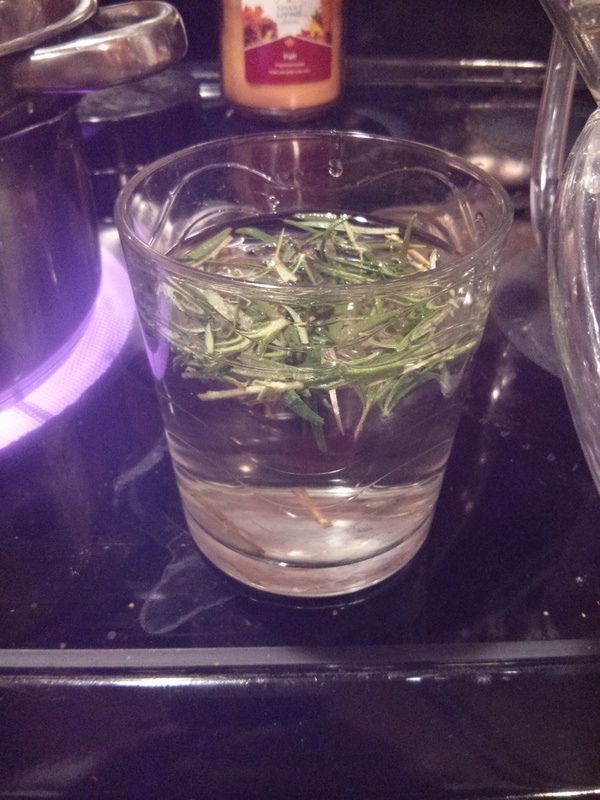 I can taste the elixir for most of the meditation (I only got a little over a half hour once I settled in) and I can smell the rosemary the entire time. Unfortunately, the next elixir either needs to see me raiding a greenhouse or putting the project on hold for the winter. We had the first frost this weekend and the plants have all gone to stem. Incense seems like merely a cheap substitute at this point. Opened by QC, LIRP, LIRH, QC. The visuals of the Archangels were like standing on a swiftly climbing elevator. A sense of motion. I assumed the Arrowhead, as I found this one easiest on the knees. I slightly modified it so I kept a straight back and the airway clear so I could maintain breath. No other support was provided. I broke at 10 minutes once to scratch my face, the next 20 were fine unassisted. I intentionally did not use any of the books I normally turn to, I wanted the meditation work to be as free form as possible. The sense of movement persisted from the QC all the way to the assumption of asana, and the first inkling of visuals occurred after my break. The motion, after a swift rise, was to gently fall. The visuals had two white pillars, and they seemed to be at the bottom of a very large crater. The descent landed on small knolls and valleys, jutting out from the side of the rock face, which would provide a small rest and the ride continued. There were columns of light off to my left. No spiritual presence was here, I just rode along like a salvia trip, enjoying things as I went. Bump, descend. Bump, descend. Bump… I saw an arm, outstretched, and it held a fist, which then was an apple, and then three arrows at the center of the shaft. Each one of these it discarded. After a bit of this I got the feeling that things were moving around in the pit. Crystalline caterpillars and other low-end forms made their way around me, as I went along. Quite beautiful, but lacking the spark of any serious intelligence, they took dim note of me and went about their business. At some point I briefly ended up in the Luna Room, and a table appeared to my right. This drew my attention to the right, where I saw lightning. The lightning appeared as an inverted Algiz. I was clearly supposed to acknowledge it as a second one would flash just to the side of the first one. I then saw an inverted Thurisaz, which turned into an arrow when I acknowledged the rune. Eventually I saw an eye, which I took to be a great snake or lizard, and the rune turned into an arrowhead and killed the beast. I then saw an inverted Tiwaz, and the lightning faded. In a rune reading I’m not a huge believer in the inverted runes being somehow reversed, so the meaning would be something like a very passive force becomes a motion which swings back and forth again. Very lunar imagery for the runes, and a pleasant surprise. I sat for a bit after the lightning, and eventually noticed a face at the edge of a crater. This face turned into a skull. The skull was talking, but without flesh, it couldn’t make a sound. Eventually I decided to consciously enclothe it in flesh, and it produced a very gender neutral figure. The figure would not talk. Eventually the flesh dissolved back to the talking skull, and we went back and forth a few times like this before I gave up trying to tease out a meaning. Trying to pick up the skull resulted in nothing. The skull remained, sort of rocking gently in the lunar sand. Eventually I thought perhaps I should enter the skull, so I did so. The sense was that the skull could transform, like a mirror. I suspect I may be able to cast or control glamours with the skull, so I plan on taking keen notes on observations from my wife and coworkers in the next few days. (I would post them, but I know at least my wife reads the blog). After that I got a sense of silver flashing right before my son kicked the door and “woke” me with a start. I said a very general thanks, and then left. I had resolved to work through book 4 in chapter in verse in the order it was presented. Of course Crowley puts the asanas first, because if people cannot control their bodies first, controlling their minds is hopeless. Unfortunately for me, I have Lyme Disease and a knee replacement from a roller skating accident as a youth, so my one knee is a rebuild and the other is shot from having to carry it. This is crap. I am the master of me, I will do asana. Everything else is an excuse. I know my faults – I am fat, I enjoy machines so I use and abuse tools to overcome my brute weaknesses, and I am aging. I am no longer 16 or even twice 16. If I say “I am too old to learn” than I have accepted the ceasing of self improvement. I have embraced mediocrity. I started out in the Dragon because KS had suggested it as his own and I figured we could swap notes. Aside of constantly sitting on my children I quickly found I couldn’t even approximate the position. Toes curled forward or up, my knees couldn’t reach. Finally in the span of 20 minutes I managed to even assume the posture stretching 5 minutes at a time. Unfortunately I was overzealous and having stretched myself into the position, both my legs fell asleep and I found myself unable to leave the position. Actual time spent? To further add insult to injury, upon feeling my legs again I pulled my muscles in my buttocks, so I had little choice except lay on our high pile carpet and type a blog post to pass the time, like the worlds most pathetic turtle. Can people who can’t asana do magic? Sure. I keep my throne of evocation as an overstuffed office chair lined with pillows. When I originally put it together, I was thinking floatation tank and not yoga. However to do Crowley’s magic, I should cultivate this skill. And lose a few stone. This is much less a magical brass tacks piece and more a eulogy written in thanks. I think hunting is probably the least discussed as a pagan or natural tradition. On one side are people who think animals shouldn’t be food. That’s entirely acceptable if you can hack the diet. On the other side of the spectrum are the “rednecks” whom South Park would have you believe empty endless clips into the woods to pile up as many trophies as they can. In actuality, this doesn’t happen. Hunting involves being one with nature, and to the people who think it’s going to be Deer Hunter 2014 – it’s pretty boring. They’re doing it for the wrong reasons, the reason is to commune. Today, hunting is not going to the grocery store, but a chance to interact with, and see the glory of, creation. In a lot of ways because the importance of survival is diminished in modern society, the magic of the experience can present itself. I woke up, and truth be told I would love to write a post like “oh I prayed and fasted and summoned Skadi and…” Well actually I changed diapers and got the kids fed while my wife finished her shower and then I took a shower. That’s not particularly magical, except for a general sense that the time of year is magic because it is the harvest. Rather the meditation came in the car ride over to the park. There’s always the mental checklist (Did I pack water? nope, forgot the water. Did I pack fire? OK I have fire, I can make water), but the ride over also gives me a chance to survey the woods and notice that society at this hour is largely devoid of people. It’s an eerie feeling while at the same time a comfort that what we do is private, and intimate. 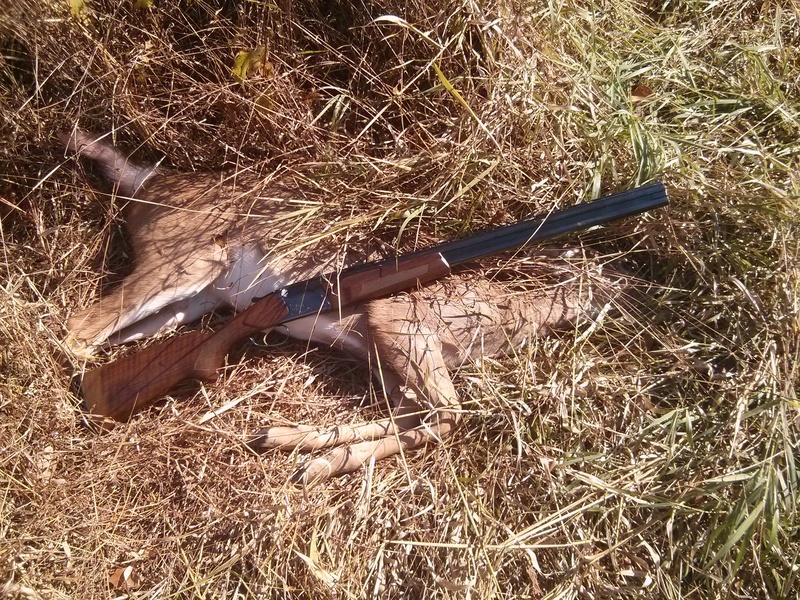 Hunting deer requires crossing a primordial boundary from the comforts of modern society into the quiet of the woods. No longer is Man the maker of the environment, but rather Mother Nature rules these quiet places. As I walk along, the horse trail gives way to countless other trails laid over it. The deer have built new ways of travel, sometimes crosscrossing and sometimes overlaid with the trail which man prefers his horse carry him through. In this way there is a concession; man’s footfalls are fewer here than “out there” in society. No more cars are here, the beast is king. To walk on the deer trails, my feet become cleft and hard. It is important to take in the light. The light of this new dawn was red, with purple. The sun rose as a glorious, full orb. The horizon burned. The trees of autumn stood proudly mirroring the braised fire in the sky. We should be so fortunate as to find ourselves in such a home. I consider myself lucky that just for a moment when the sun is rising and still low, the leaves in the trees present the most beautiful living stained glass cathedral. I hope my children appreciate this. I hope the woods should live forever. The air is chilly, even with an M65 jacket with liner doubled up and handsewn buttons, the camouflage provides no emulation of the fur which the animals enjoy. The fur is perfect, and perfectly suited to the woods. Each animal is clothed in fur ideally suited to its environment and colored as best as any Main St tailor might hope to produce for a king. The deer, in my world, is truly the king of the woods. Wreathed in horns and deft in foot, they slip silently along. First, they eat grass, and as the wheel processes they prefer the delicacy of the newly budded, verdant plants as their leave unfurl from winter slumber. Today, there is no snow. The deer walk along creekbottoms and sleep under pines. They mingle in tall grass and hold court under wise, thick red Oak trees. Soon, they will flirt and breed and calf, as they affect the cycle of life in the forest floor so do they themselves honor the circle of the spheres and reproduce. I think these things as I smoke my pipe. The pipe is briar, the leaves from a far away land. A doe appears. Deer do not merely walk, as any hunter will tell you, they evaporate and move place to place unseen and unsensed, unhurried and unrestrained by gorges, gullies, and stream. Or that’s what hunters believe when we comfort ourselves. My ancestors take over. The history of the bow is the history of mankind. I hardly feel the smoke and the fury of the moment and in that instant, we are one. We trade places. No longer is the king of the woods the deer, but he is me. The age-old dance continues, the Oak King is pierced by the Holly King. The King shudders, and dies. The entire forest is still for a moment, perhaps shocked at the violence of this event or out of respect for everyone involved. I give thanks to the deer for this moment, and we rest together. There is however one more trick the deer has, for neither of the Kings truly ever dies. Part of the deer is spilled on the ground in the final moments, and this blood is rich heartblood which nourishes the grass for the forest, and thus the other deer. The entrails will provide food for Odins consorts, and other animals too. Did the deer have a happy life? The liver tells me with a rich dollop of fat on top that the deer ate well and was happy. The heart is the last to come, I eat it as fresh as possible, as the heart should become my heart. I cut my hand as I work as mindfully as possible – perhaps not as much as I should – and realize some day too, I will feed the forest. Until then, this deer will feed me and my family, and with due respect I hope other deer will too. Rufus apologized, hopefully everyone can get along. How to Calculate Your Very Own HGA Values for Free! The next page is largely pedantic but I prefer setting “chart selection” to “Astrodienst Style”. Under “additional objects” select “part of fortune”. Hit the “click here to show chart”. If you scroll down below the wheel, you’ll see a grid with the planets. Head over to the Daimon Name Calculator. It’s a handy tool. Notice the numbers before the degrees. When it asks for “sun” the answer is “12”. 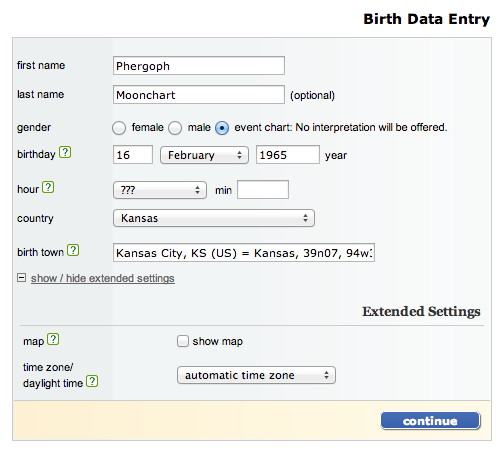 “Moon” is “15”, and so on, providing the astrological signs to the calculator. AC is Ascendant, and P.Fort. is Path of Fortune. But what’s Prenatal Syzygy? It’s the last full moon or new moon before you were born. This is where me and Rufus differ, I’m at least exposed to Arabic magic so I know that there’s “Day” and “night” births. Rufus would just use the full moon. Here’s the trick – if you were born at night, use the new moon. If you were born during daylight, use the full moon. Lets pretend I don’t remember! 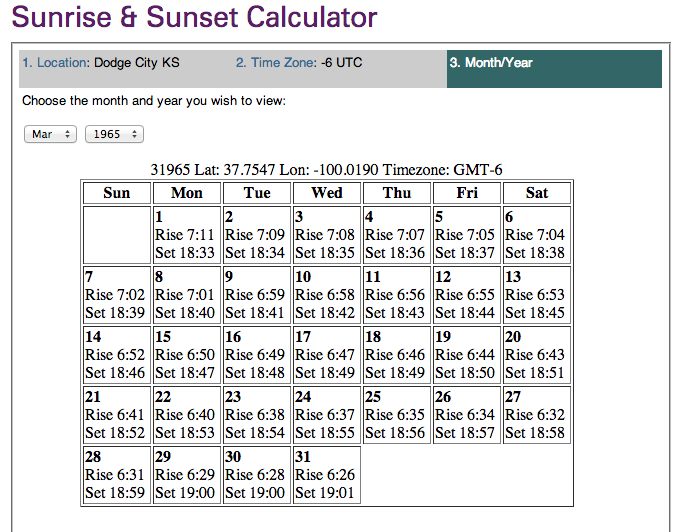 Head over to StarDate and we’re going to use the Sunrise Calculator first. Don’t worry about getting the geographic location exactly right, you’ll only miss a few seconds. We can see on the 3rd, the sunrise was 7:08am, so we know for this person I would use the full moon for a Day birth. From here, we flip to the night calculator. 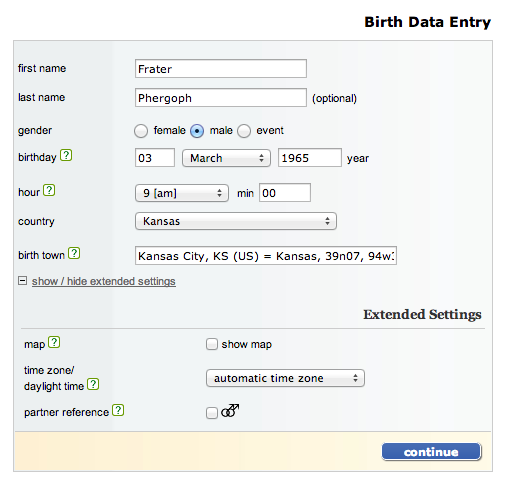 Putting in the dates in the drop down, we see the 17th was a full moon. However that’s after the birthday on the 3rd, so flip the chart to the previous month. 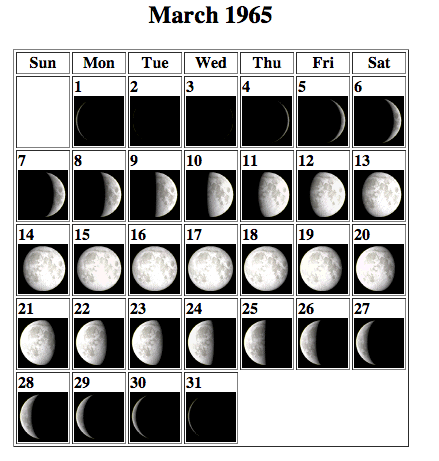 Turns out the full moon was on the 16th of Feb in 1965. 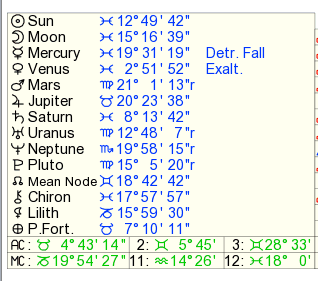 Notice the moon phase we are interested in for the month is after the birthdate. Use the previous month. From here, head back to Astro.com and notice the custom chart link now has your data. Click “add new person” and put your name in there with “moon” or something so we can flip charts. Select “event” chart. Click “submit”. The same box will come up but under it is the calculations you want. The Rufus method here is to simply read the Good Daimon name and append -El for Angelic and -Ah for Daemonic. Since we considered the Day and Night aspects of birth, Arabic flavored magic will answer to these names. Your Good Daimon is your HGA. Your Evil Daimon is not your “holy guardian devil” but more like your own personal goetic spirit. It hangs out in the lower realms and gets things done on the physical plane. This also means it offers up plenty of temptation by doing what the operator wants without regards to morality or consequences. How do I use the names? The footnote is Osoronnwfris enumerates to 2220. Crowley has “Asar-Un-Nefer”, which he translates as “Myself made Perfect”. This is where you put the name of the HGA. Use whichever name you’re comfortable with or consider using the “value” line to find a value you’re comfortable with from Gematrix.org and use that name. But, this is the “preliminary invocation of the Goetia” to Crowley and that’s the gold. You would summon your “evil daimon” as a spirit from the Goetia… For the primary evocation, add your HGA’s name to the list, and call the Daimon with that. Had deeply intense dreams last night not of the normal sort. An Angel appeared and led me around to show me various aspects of life and such. Lunar influences getting goofy, I should probably do some HGA work. Last week in Letters to Phergoph, I posed some questions to someone who was interested in Ceremonial Magic. I think one of the major differences between Wicca and Ceremonial Magic is that Wicca is a lot of “let’s get what we want” and really ignores the greater philosophical questions posed by why things work (or when they don’t). Is it safe to use the Goetia without first engaging my HGA? Yes, and there are examples of people sticking to the system and using the protections outlined in the Lesser Key and there are examples of additions to the system which people have used. 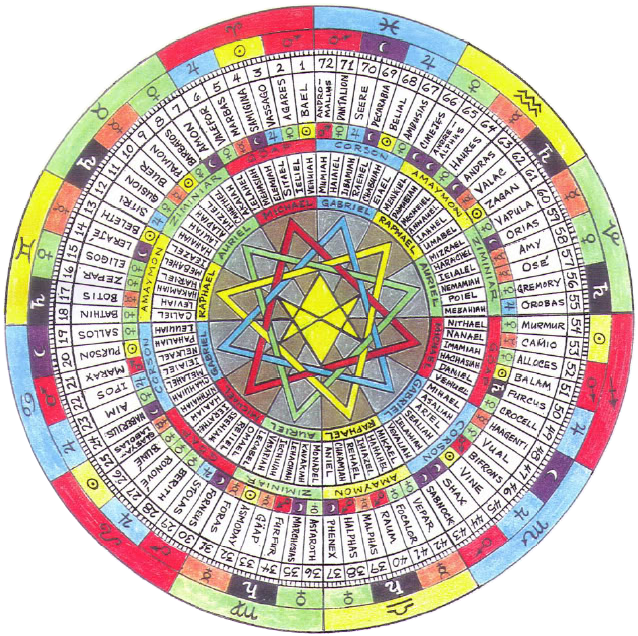 Poke Runyon has the Master Mandala which he reveals in the Book of Solomons Magic. In the Goetia of Dr Rudd, Rudd adds protective Psalms to the back of the spirit seals. This is a move directly out of the 6th and 7th Books of Moses. Personally, it helps to have an Angel watching out for the operator, be it the HGA or one someone has summoned before the operation. The original operation though relies on the purity of the operator for their protection, which includes the spiritual purity to resist the temptation. The overlap between Voodoo and the Lesser Key? There’s numerous overlaps and more than enough to convince me that this is the same system. Leitch does an excellent job tracing the parallels so I will save the readers. The lack of the triangle is the most impressive part of the operation as far as I am concerned. The people being “ridden” by the spirits are actually being possessed by those same near-earth spirits. Perhaps the most interesting observation to me is that Crowley in the desert has extremely similar elements to people being ridden in voodoo. Why do you suppose that the Goetia are easy to contact? The goetic spirits are the spirits who live adjacent to our plane. This is why they lust for material things and this is also why they are so effective at making changes to the material world. If they’re the Old Gods – the Bull El, the Baal – they were worshipped long before men desired abstract forms of wealth and power. Back in the citystate era, each city had a patron God and the God was petitioned mostly for crops, weather, protection, and such. Rudd takes this to its logical conclusion by assigning spirits in the Lesser Key to individual parts of the earth, not unlike the Earth according to Ptolemy. That being said, most people who are just starting out their spiritual careers are doing so because of a desire to be comfortable, or at least in desperation, and so they are effective at petitioning spirits who provide material comfort. There’s nothing wrong with that. As the individual advances and becomes interested in philosophy, they become better at contacting higher spirits. Conjecture – Spirits are parts of ourselves. This must be true because we cannot conceive of things we don’t know. I cannot make up a new color. I cannot call some guttural sounds a word without giving it context and meaning. Furthermore because spirits are limited to constructions which pre-exist in our minds, we have no use for spirits who are unrelated to activities we are engaged in. Conjecture – Spirits are independent entities. This must be true because ideas and situations arise gestalt without our intervention. If I close my eyes, although I am cut from perception, clouds still form and light still plays across a blade of grass. Similarly in the spiritual plane, although a man may have no spiritual life, he is still subject to ideas and desires, which he endures like a cork on the sea. The truth, I suspect a lot of people will affirm, lies in the middle. Although we cannot think of a new color, we use existing colors to display colors we cannot perceive, such as infra-red or ultraviolet. In this way we provide a mental and spiritual model, or half of the bridge, for spirits to build their half of the bridge into our spheres. Calling on a treasure hunting spirit in this modern age might produce a lost ring or a bag of money meant for a drug dealer in a drop. Calling on a spirit whom makes Kings would assist in the rise to political power or a workplace promotion. Can we definitively prove spirits exist? The best argument I’ve come up with after many cigars and scotch is that the psychological model of “things happen because you are looking for them to happen” falls flat. I can be looking for that lost ring, and despite desiring the thing with a single pointed ray of Will and the desperation in my heart, I cannot apport the ring. The ring simply will not appear. At the same time, asking spirits to help achieve a goal will set the spiritual wheels in motion to achieve that goal. If I take that ray of will and burning desire in my heart and I use that energy to conduct a ritual to summon a treasure spirit, then the ring will surely appear. Without ending up in pedantic brass tacks over which parchment and circle I used, this is the difference between the emotional and psychological models of magic, and the idea that petitioning things which have a disincarnate spiritual life produces subtle but productive influences. Perhaps the spirit guides us to walk down a different street or has our bus break down so we’re forced to walk a new stretch of road. These are things we don’t mindfully do, but I can hardly think of a productive way to cast a spell to cause the unique sequence of events without the intervention of intelligent design. The difference between the spirits, not subject to time, and us, is a firmly gnostic concept that we are the results of a universe created by the first mover, but we are the first movers in a smaller, personal universe created by us. As we perceive, so we create. I was packing up the stuff after what I thought was a failed night and I had set the stem to epoxy on the chinese glassware and was lugging my buckets and beer making equipment out to the garage. 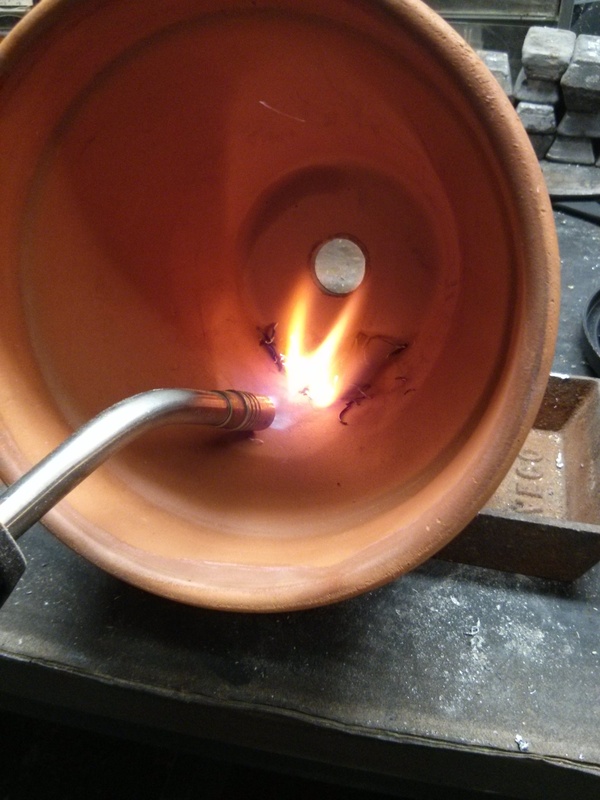 I typed up the previous post marking it as a failure that was a good learning experience (if not expensive breaking the glassware for want of a proper lab clamp) and set things aside to cool down. By the definition of the ThAOI Alchemy document, this was a failure. However anything the operator puts their energy into (which is really the purpose of alchemy) and anything which effects a change or refinement in the matter (no matter how crude to the standards of our peers) is proper alchemy. Now this is something I wish I had taken a picture of. 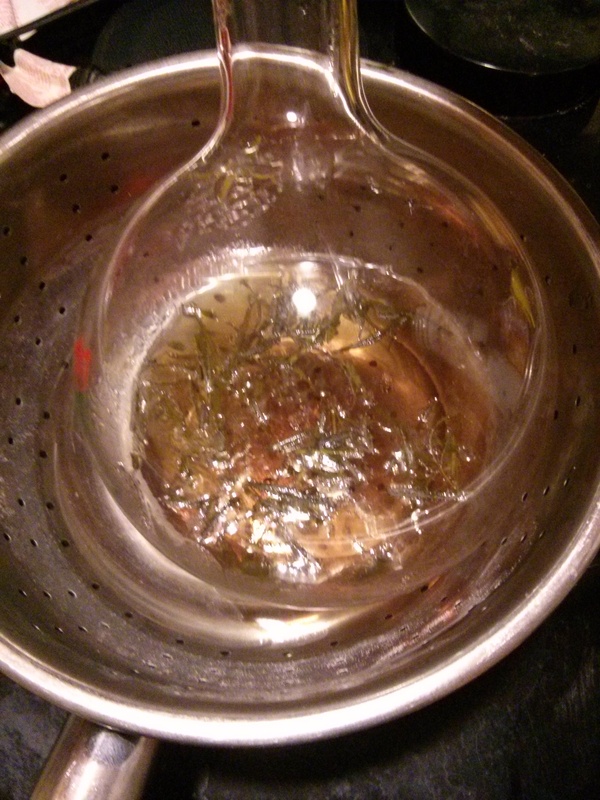 When I started out, the rosemary tea was “green”. About halfway through it was “red”. I noticed it was browning and it got my attention. Also on that note, the color change is mentioned many, many times in alchemy. I decided to go for it. So, the complete process was say the Lords Prayer (“Give us this day our daily bread”…) over the plant in the day and hour of the spirit (Luna), snip the plant, chop finely, put in double boiler to make tea. 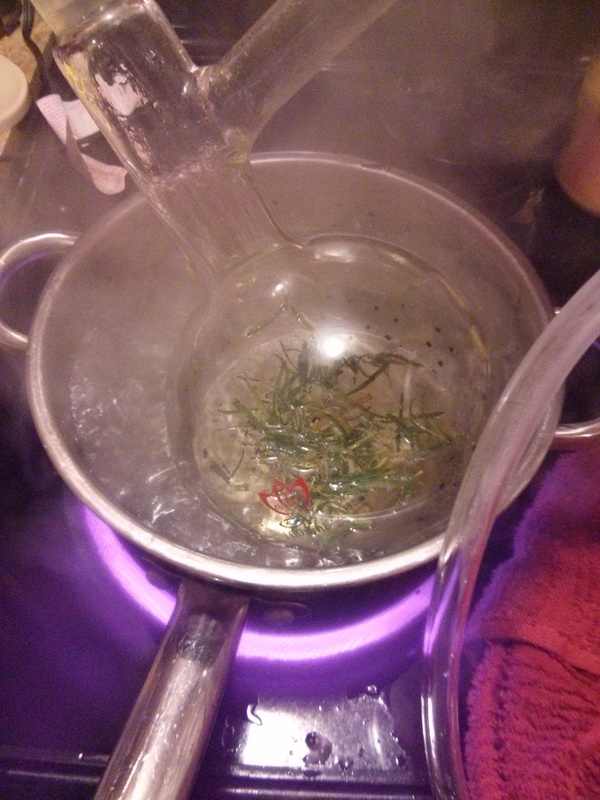 Now if I insisted on the distillation, I would say once the tea is made in about an hour, move it to open flame and get the distilling going. However if we want to avoid this, we can put it on heat for two hours (the amount of time it took me to boil out the water from the bottom half of the double boiler) and this seems to do the trick. I intentionally put in about 500ml of water and material, and I got out about a rocks glass (~300ml). Either my glassware had a leak or something isn’t sealed right because there’s a sizable portion of water which I don’t think would have filled the volume of air. 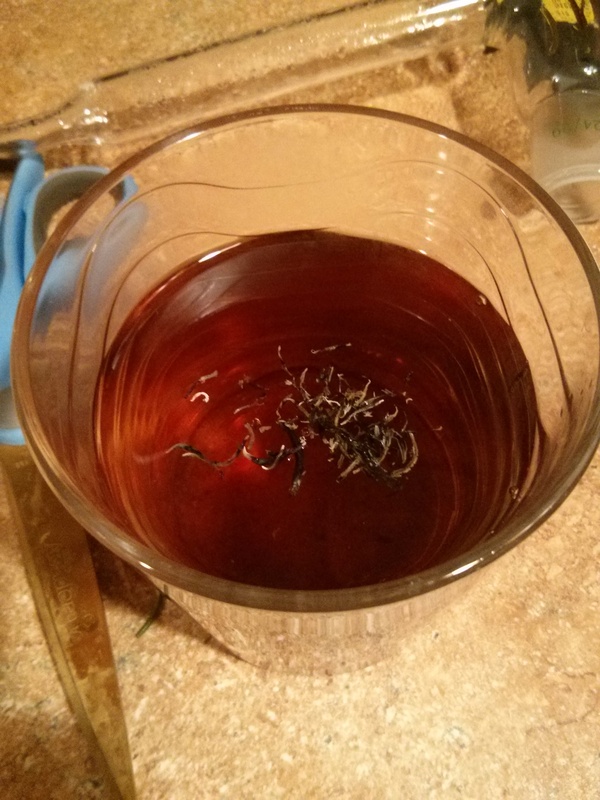 From there I poured the remaining tea into a glass through a coffee filter. I took the coffee filtered leaves (they come right out of the glassware with a swirl) and dumped those into a clay flower pot. I took the flower pot into the garage and hit the leaves with a blowtorch until they calcinated (turned white) and then dumped that back into the mixture which I stirred. Let tell you, it smells like perfume. I’m letting it sit (covered) for a week in the bowels of the earth (my basement). If you’re wondering how to control the flow, turn it down until you get a standing bubble. So long as that bubble doesn’t move, it’s as slow as it’s going to get. The bucket is full of ice. Color starting to come through. Different angle. Eventually I swapped out the teapot for an old lamp. This is the flask in a pasta bowl. It holds the flask. The starting setup. 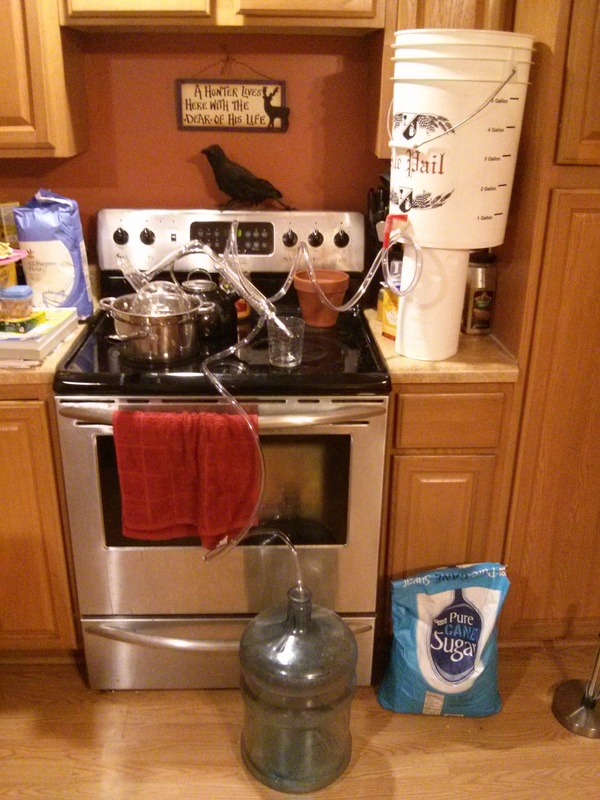 To quote my wife – it looks like a meth lab in here. Alright that’s the prep and process, but how did it look on the far side? Blasting the material into white ash. White ash. The pot is to keep the ash from flying away. You know this is done right when the stuff really tries to escape. The finished elixer with the ash in it. Stir! There’s enough for both me and my wife and it smells and looks awesome. This should kick the evocation up a notch. The first alchemy experiment went poorly. Although its good to fail and I have no problems admitting my highschool practical chemistry is sorely lacking 20 years later in trying to set this stuff up. What I do know about distilling is wholly for booze, and I was told that since we’re not working with booze, its probably between to not worry about things like “what reacts with copper” and stick to stuff we know. 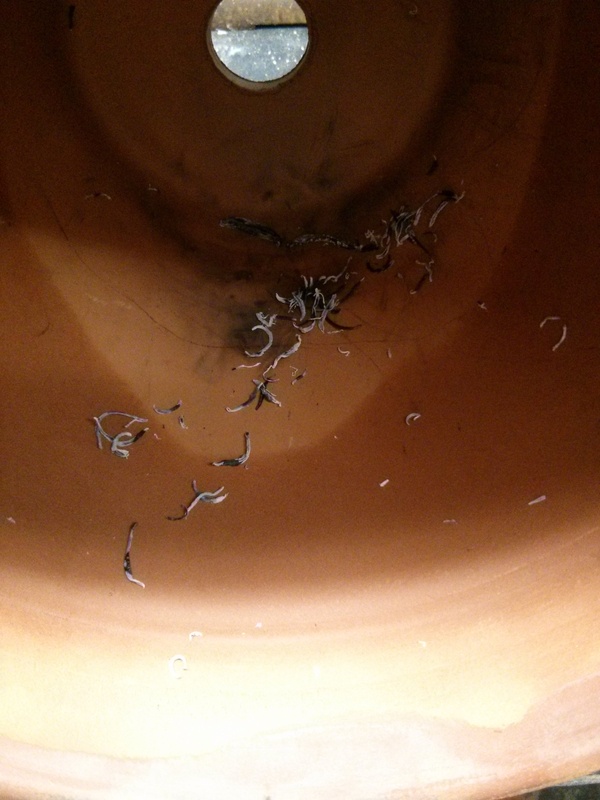 The other problem was calcination – I was using a blowtorch on bricks and the plant matter is super, super fluffy when it hits “white ash” and it blew out into the woods and god knows where. I tossed the entire experiment out and never got around to reducing the “tea”. 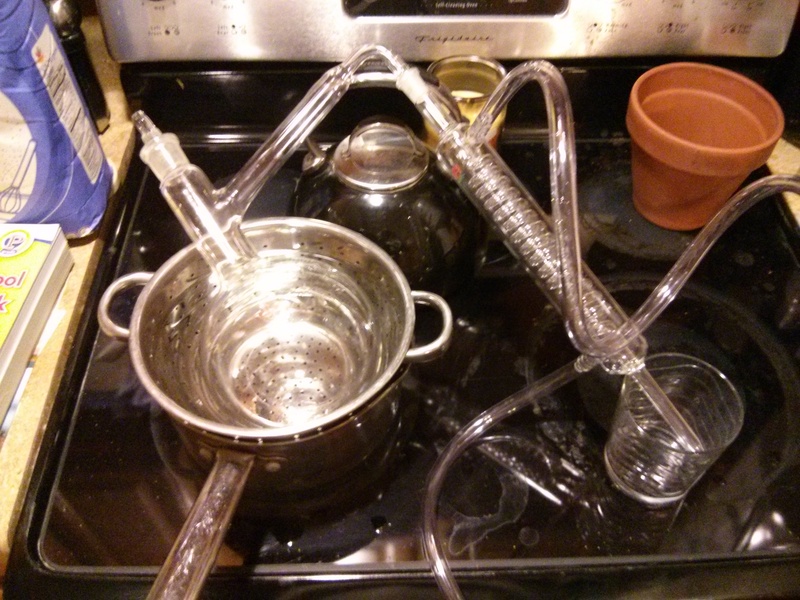 The other big problem is trying to keep the glass condenser filled with water. 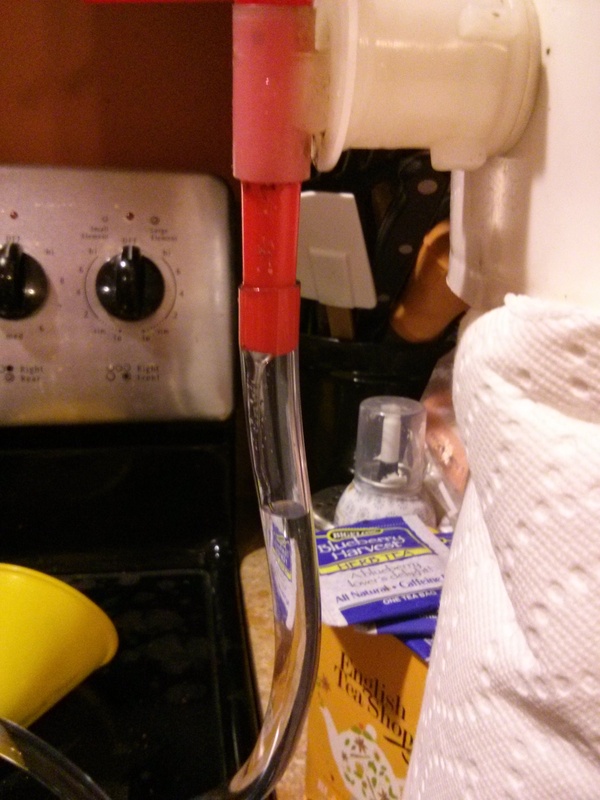 I’ve found that by restricting the flow on the outlet side with a simple kink and a chip clip I can get more water in the top. It does like to air bubble though which will kill the flow. Fortunately we’re making plant elixers here and not alcohol so the glass doesn’t get enough time to heat up by itself and reduce the condensers efficiency unacceptably. WIZARD TIP – submerge the condenser in water and get the air out first. I’m probably going to end up buying a hot plate. WIZARD TIP – wet rubber on your lab tower won’t hold your condenser. I broke the tip off mine doing this stuff because I turned on the water, it slipped down off the lamp I had repurposed for this, and hit the glass beaker. It’s nothing I can’t epoxy, but it’s still a real pain. 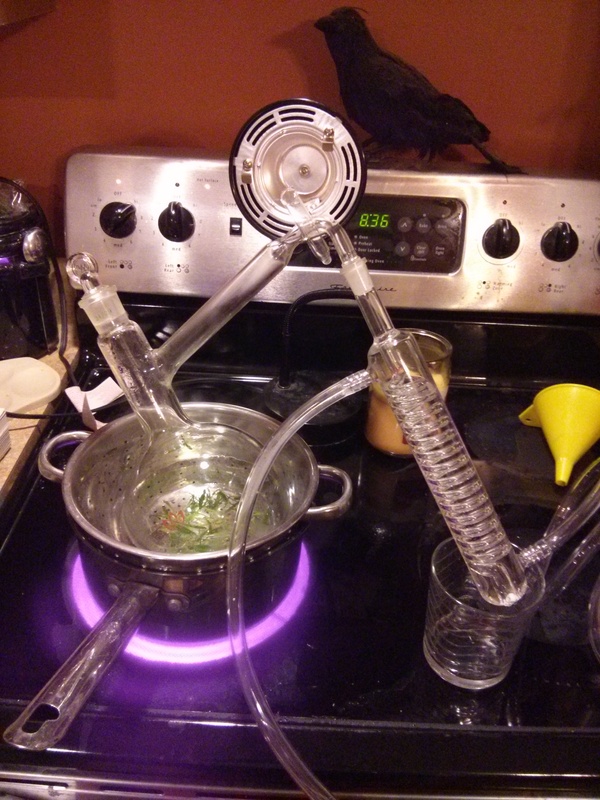 WIZARD TIP – the condenser can outrun the double-boiler and since the apparatus is glass-on-glass, there is significant thermal transfer. And that last Wizard Tip is what killed the experiment. 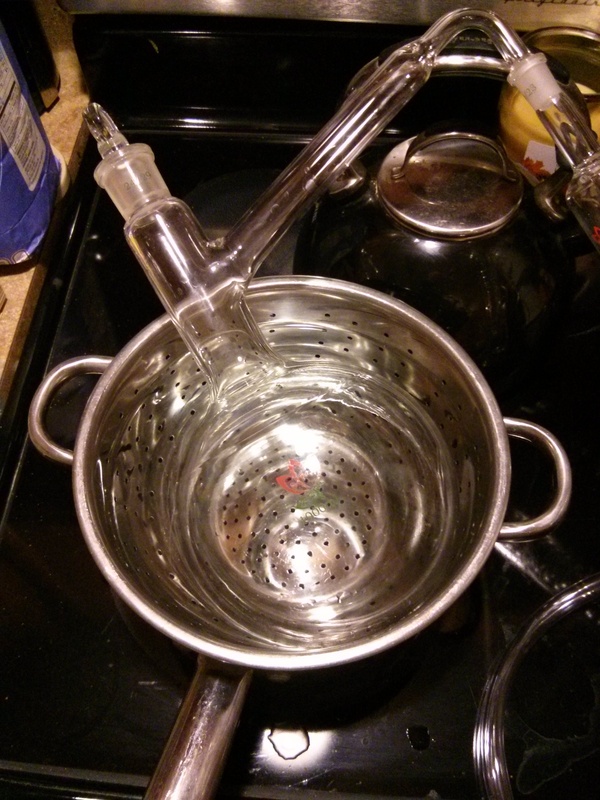 I started running water in my double-boiler setup immediately and set the flow rate to really low. The result was that unlike last time where I had a very low propane flame cooking the material, this made more of a tea. The stuff last time was brown, wilted, and such and didn’t get much out of the condenser, and this time the stuff is still wonderfully green in the liquid. I think the “tea” is a good step and I did it improperly last time. Even though I didn’t get any flow through my (now broken) condenser, I think I’ll add this as a “first step” to the list before going all out over the propane.